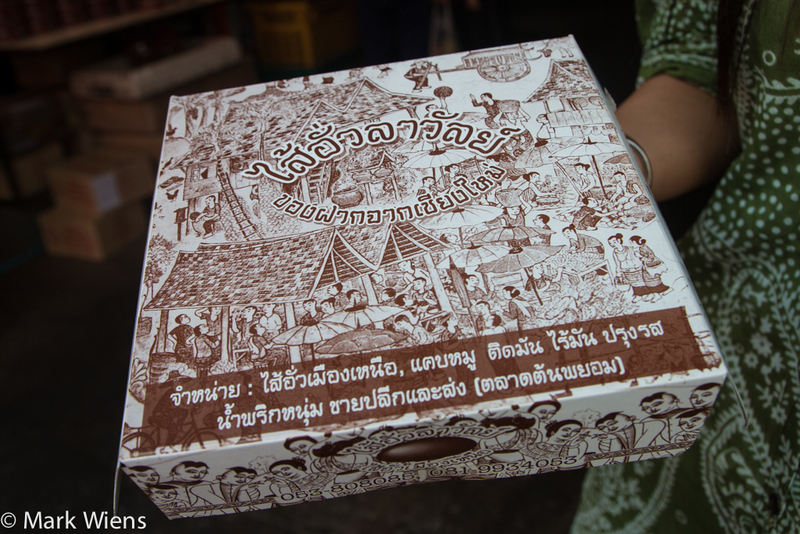 Sai ua (ไส้อั่ว also spelled in English as sai ooah) is one of the foods that Chiang Mai is most famous for. 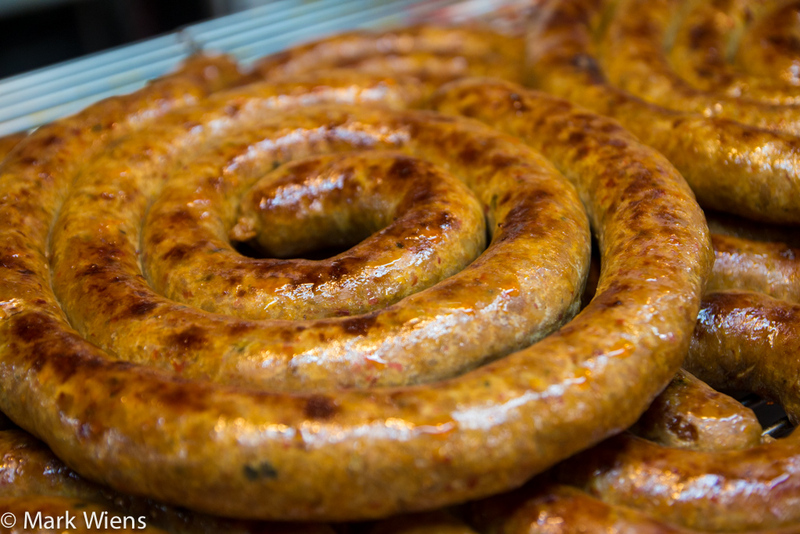 It’s a famous northern Thai sausage that’s infused with a beautiful blend of spices and herbs, which makes it some of the most flavor loaded sausage in the world – all wrapped up in that beautiful orange coil of meat. 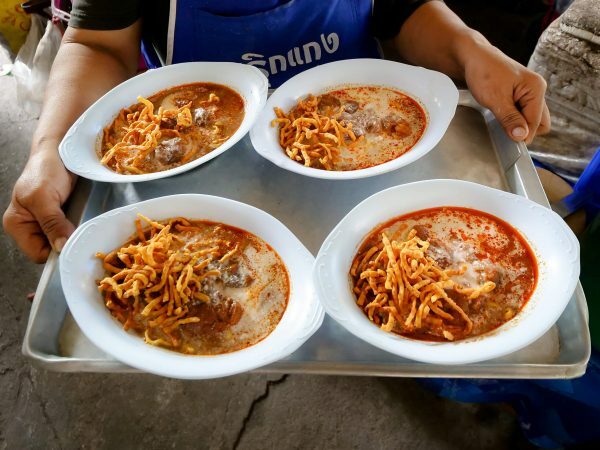 There are literally probably hundreds of different places to eat sai ua (ไส้อั่ว) in Chiang Mai, and it’s commonly found at street stalls and markets throughout the city. It’s also normally available at northern Thai restaurants throughout Chiang Mai like here and here. Everyone seems to have their own opinion about which sai ua (ไส้อั่ว) vendor is the best, and if you were to set out to sample all the sai ua (ไส้อั่ว) options in Chiang Mai, it would be quite the mission impossible. What is Sai Ua (ไส้อั่ว)? 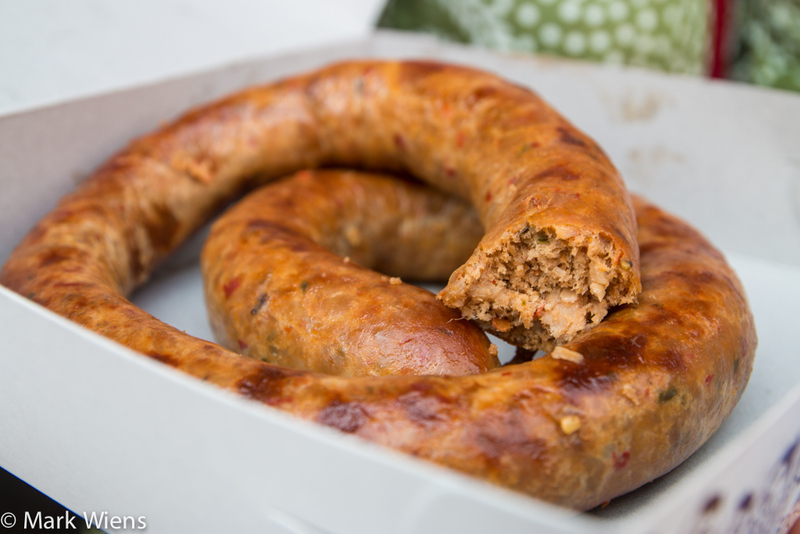 Sai ua is a northern Thai sausage made with a combination of pork mixed with a medley of herbs like lemongrass, kaffir lime leaves, and galangal, and also usually some red chili paste. 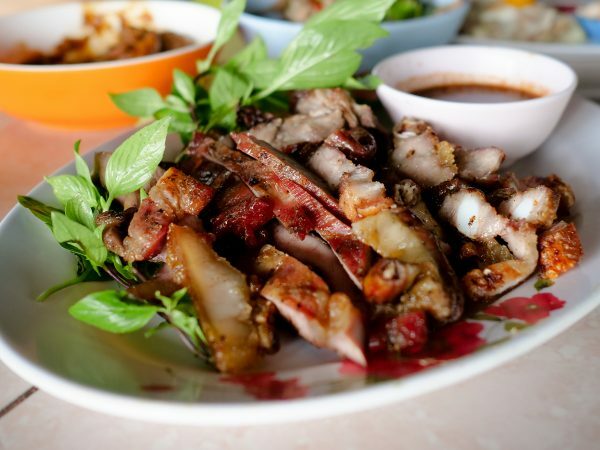 The mix of meat and aromatic herbs are stuffed into an intestine wrapper (at least traditionally), wrapped into a beautiful coil, and grilled until golden orange brown. Oftentimes they actually broil or bake the sausage nowadays (but at some ready to eat street food stalls they still grill them). You’ll find many of the famous sai ua (ไส้อั่ว) vendors at the Wararot Market, located right in the heart of Chiang Mai. Another place to go, a market where plenty of locals go to get their sai ua sausage fix, is at Ton Payom Market (ตลาดต้นพยอม). 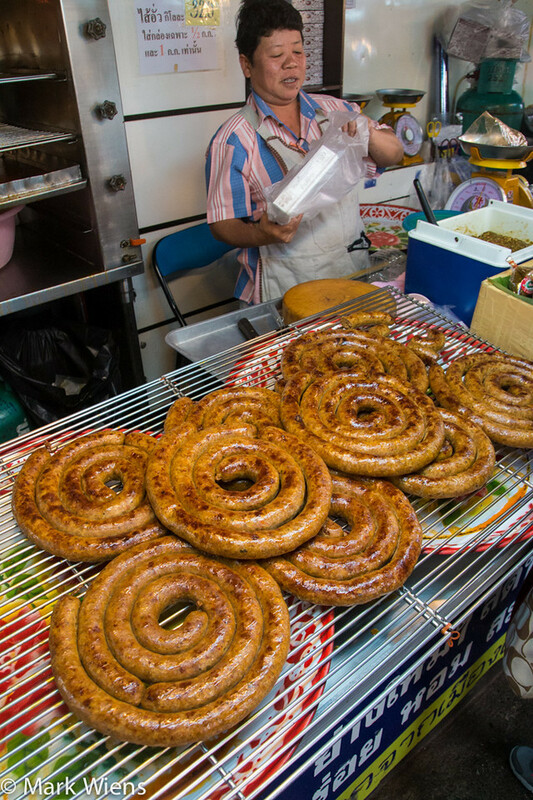 Even within this relatively small market, across the street from the Chiang Mai University, you’ll discover a good handful (maybe even 10) vendors all selling their own variation of this Thai sausage. In the end, you’ve just got to make a choice on where to buy your sausage, and I went with Sai Ua La Wan (ร้านไส้อั่วลาวัลย์), one of the more famous vendors at the market. You order by weight, and we got 1/2 kilo, which was a pretty good sized ring of sausage, and cost 160 THB. 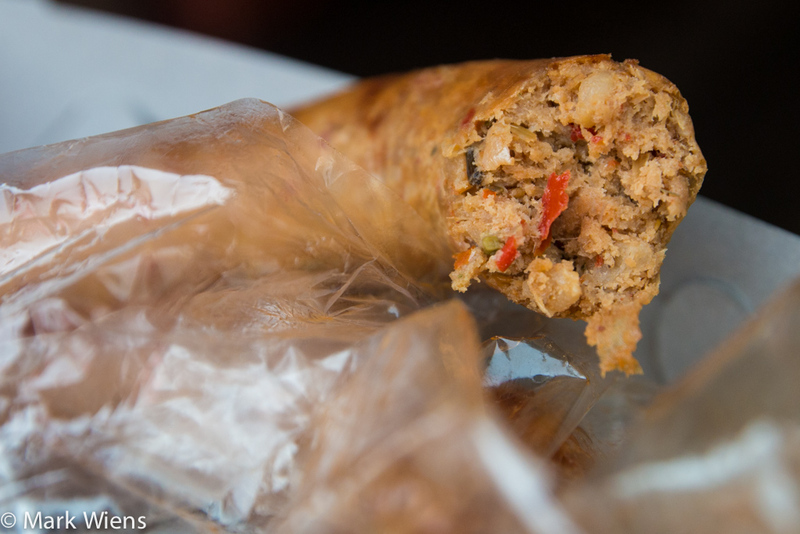 If you buy sai ua (ไส้อั่ว) from the market (not from a pre-cooked street food cart or a restaurant), they usually specialize in takeaway, so after you order your sausage, they wrap it into a plastic bag, and even package it up pretty nicely, quite similar to a box of goodies from Char Hung Sut. Despite the nice packaging, I was ready to tear into that gift wrapping as fast as I bought it. As soon as the plastic bag opened, I got a whiff of lemongrass and chilies mixed with meat that hit my nostrils and made me all the more excited. Sa ua (ไส้อั่ว) has such a wonderful herb filled aroma. Can you see all those delicious herbs and spices? Some recipes of sai ua (ไส้อั่ว) are more fatty, others are more spicy, or more lemony from lemongrass… it all depends what place you go. I tend to prefer sai ua (ไส้อั่ว) that’s a little less fatty and more herby and filled with spices. The sausage from Sai Ua La Wan (ร้านไส้อั่วลาวัลย์) was not actually as strong of herbs and spices as other versions I’ve tasted, but it wasn’t too fatty, and the spice blend was extremely well balanced. It had a nice kick of lemongrass which nicely balanced out the chili and galangal, and each bite finished with a tiny hint of sweetness. There are so many wonderful sai ua (ไส้อั่ว) vendors in Chiang Mai, but exploring the Ton Payom Market (ตลาดต้นพยอม) is a good place to get a local sample of this northern Thai meat speciality. เปิด 8.00 – 17.00 น. How to get there: Just like in all of Chiang Mai, if you don’t have your own motorbike, the easiest way to get here is by taking a rot songthaew. This market is a little outside of central Chiang Mai, but still not too far away. sorry for asking this question, because you’ve probably answered it before, but are there any places in Bangkok where one can get Sai Ua? Or Pattaya and Hua Hin? I’m also addicted to the stuff. I’m also going back to Tom Yum Goong Banglamphu, which you recommended. It’s stellar. I’d love to have a good recipe so I can make this in the US. You were right. The sai ua from this little lady in Ton Payom Mkt is off the hook! Tks for the recommendation! Hey Hsu, glad you enjoyed it! In preparation for my trip to Thailand I have been watching ALL of your videos. Yours are indeed some of the best available. I will be visiting Bangkok, Chiang Mai and Chiang Rai. So I just wanted to say Thank You! Absolutely love Thai food and plan on hitting as many of the spots you have showcased as is humanly possible in a month. Hey Bobby, great to hear from you, thank you very much for watching and great to hear you’ll be coming to Thailand soon. Enjoy the food! Hello again Mark, I ate Sai Ua everyday while in Chiang Mai and from every vendor I could find. The variations were all good but I will admit some were spot on to my craving for spice. One thing I learned very quickly when ordering being a farang is เผ็ดมาก (P̄hĕd māk) is required. Thankfully my friend from BKK helped me immensely with my Thai as she knew I actually ate spicier than she most times. I always wondered how you ate so much in your videos. Here in the states I eat maybe twice a day, work out and only used sugar subs and still stayed fat. My friend and I while traveling ate no less than 5 times a day. I drank Thai Coffee and Tea, smoothies and juices all day as well. Not loads but often as there was always something insanely delicious to eat. I ate more in Thailand than any other country I have visited. The odd thing is I lost over 10 kilos in 3 weeks while eating non-stop. I am home now and thankfully had her teach me some basics on Thai cooking. I am now building my shopping list from your recipes I must try and pray there are many more to come. You are an inspiration sir, Thank you. Thank you for this post and the accompanying video. I’ve travelled several times to Thailand and in particular Chiang Mai, but hitherto was obsessed with Sai Krok Issan. I had not tried Sai Ua until my most recent visit based upon your recommendation. Unfortunately now that I’m totaly consumed by my quest for more, I am unable to procure it in my home town, Adelaide Australia. Fortunately I struck up several good friendships with street vendors and along with rollicking tales I accumulated many eclipses and many tips. I am now embarking on the project to make my own perfect Sai Ua. I must admit that in spite of the fact that I was in cities with 8-12 million people, I still kept one eye out in the vein hope I may see you blogging about some new bit of impossibly yum goodness. Probably best I didn’t, whilst I believe celebrity should be entitled to their privacy I don’t know whether I could prevent myself from boring you with tales of food, travel, cooking and of course snapping the ubiquitous invasive selfie. Thanks again, for this and all your blogs and videos. I am hoping I will have an opportunity one day to see in Australia the current television work you’re doing. I accumulated recipes, not eclipses. A combination of tiny keyboards, fat stupid fingers and autocorrect conspired to paint me a fool. 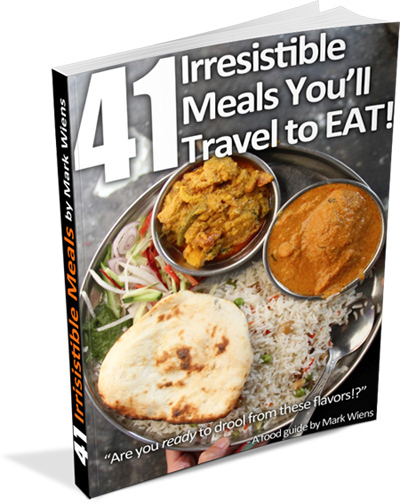 Hey Mark, great to hear from you, glad you love Thai food, and especially sai krok Isaan, and now sai ua sausage. 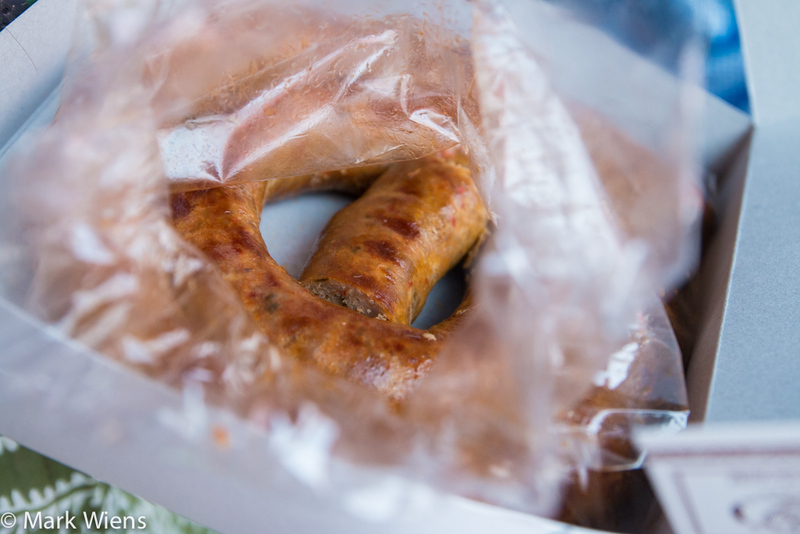 It really is one of the greatest sausages, so much flavor packed into it. Glad you found found some recipes and are perfecting it. Thank you very much for your support. Hm.Can I say I don’t like sai ua?But it is worth to have a taste in Chiangmai.If you have chance,you can try Chinese sausage. Thanks for reading Helen. 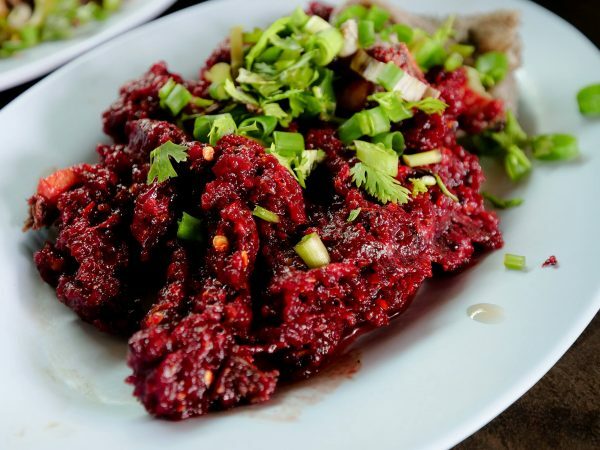 Chinese sausage can be great too! I love sai ua. Living in Khon Kaen, it’s not readily available. There is a northern Thai restaurant on Pracha Samison that has it (alson with khao soi). Also, the OTOP fairs, especially the one at Jubilee Hall on the KKU campus, have it. You would think that Isaan sausage would be spicy but it’s bland and rather sweet. Does not compare to sai ua. Hey Tony, thanks for sharing, glad you love Sai Ua too, and glad you can find it in a few spots in Khon Kaen. I ran across this recipe for sai ua, if you want to try making it. I’m going to give it a try when I get some time. Consequently tasty! That appears to be irresistible! Hmmm. Sai Ua. 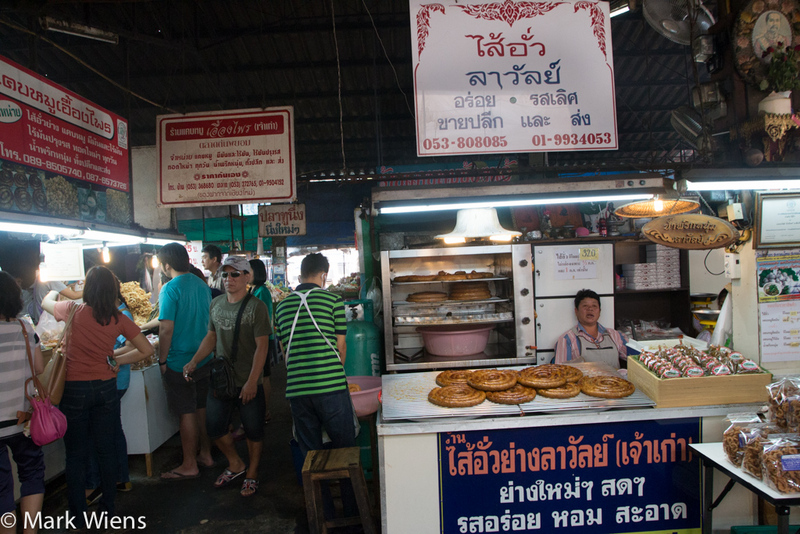 Everytime when I go to Chiang Mai I have to stop at the Ton Payom Market for some Chiang Mai delicacies. It’s great that you can taste the Sai Ua at different vendors. I’m quite picky and it depends on the mood I’m in which one to pick. I really miss it. Great Thai sausage along side the wonderful Sai Krok Isaan. Hi, great to hear from you, glad you love sai ua as well. Yes, sai krok is delicious too. The best Sai Ua (also least expensive, 15 THB/sausage) can be found in a small cart next to a house on Moon Muang Soi Six a half-block up from Rachaphakinai going toward Somphet Market. They cook in the early morning, and not every day, but worth seeking out. This is not a restaurant, just a small stall by the side of the road that the little old ladies have set up. I find that this Sai Ua, along with dijon mustard on a baguette makes an awesome sandwich, a mix of Thai-French for the best of both. Awesome, thank you for sharing Jeff. Is it more of the herb filled type? Next time I’m in Chiang Mai, going to check this out. And with some dijon mustard, that sounds marvelous.